Why dine in a regular restaurant when you can dine in the sky in a hot air balloon, or in a cable car, or even on a 50 m high table! Dinner in the Sky was created in May 2006 by Hakuna Matata, a communications agency that specialised in gourmet pleasures, and The Fun Group, a company that specialised in amusement park installations deploying cranes. Together they introduced an incredible exclusive experience: a flying dinner table. 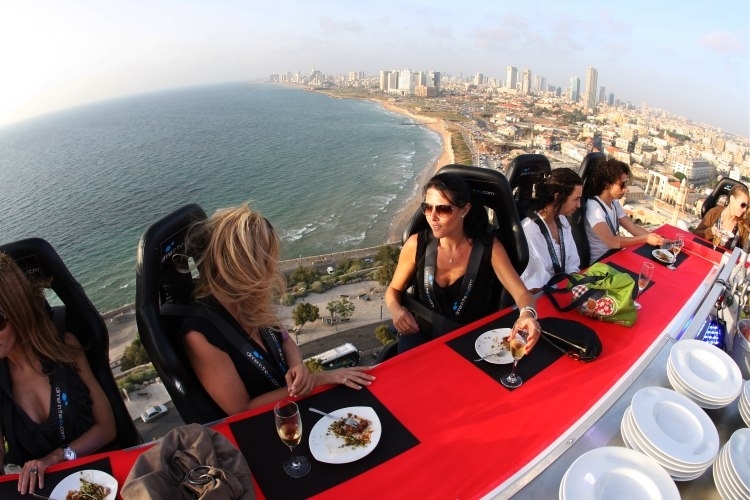 Named ‘Dinner in the Sky’ (dinnerinthesky.com), it hoists 22 guests and up to three chefs 50 m up in the sky. If you wish for entertainment, another platform is hoisted to the same height upon which live performance is set up. View the slideshow above for more phenomenal options of dining in the sky! Tagged Experiences, Food & Drinks, LifeSpice, Luxurious lifestyles, Luxury Travel, The Good Life. Bookmark the permalink.